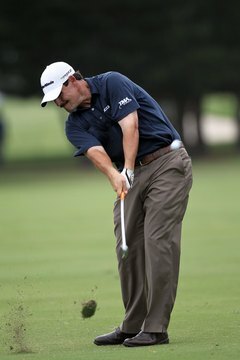 Johnson Wagner plays a shot from Waialae Country Club's narrow fairways on his way to victory at the 2012 Sony Open. Golf courses must typically undergo some changes when they play host to PGA Tour events. One of the key changes the tour suggests is the narrowing of a course’s fairways. By offering a course with more rough and less fairway space, the typical tour venue provides a challenge worthy of the best golfers in the world. A PGA Tour agronomist will typically visit a course two or three months before a scheduled tournament. The agronomist will make recommendations regarding the course, including its fairway widths and shape. While the tour believes fairway width must vary on holes for a variety of reasons, its guidelines call for fairways to be 25 to 30 yards wide in the expected landing area for a tour player’s drive on par-4 and par-5 holes. The Nationwide and Champions tours use the same guidelines with respect to fairway widths. PGA Tour guidelines take into account situations where fairways must be wider than normal. For example, in areas where narrowing a fairway to fit the guidelines would force fairway bunkers to be deep within the rough, the tour will likely permit the fairways to be wider than usual. The tour also allows for wider fairways to permit proper approaches to all the hole positions likely to be employed during the tournament. Typical PGA Tour fairways are 30 to 32 yards wide on average, according to golf course architect Jeffrey Brauer. But fairways usually are narrower for major championships, averaging as little as 24 yards wide. Oakmont Country Club, for example, has played host to many majors on the men’s and women’s tours. Oakmont’s average fairway width is usually 28 yards, although it was narrowed to 26 yards for the 2007 U.S. Open. Waialae Country Club in Hawaii, home of the Sony Open, has some of the toughest fairways to hit on the PGA Tour. In 2010, for example, only 47 percent of tee shots hit the fairway during the tournament. As of 2011, Waialae’s fairways averaged 28 yards wide at the 250-yard mark, 26 yards at 275 yards, 27 yards at 300 yards, 32 yards at 325 yards and 29 yards at 350 yards. A typical American golf course’s fairways are 35 to 45 yards wide, according to Brauer. The course architect notes that scratch golfers will hit a 32-yard-wide fairway about two-thirds of the time, while 20-handicap golfers require a 40-yard-wide fairway to achieve a 66 percent success rate. Cybergolf: What is the Acceptable Width for Fairways? What Are the Average Yards Per Club for a Pro Golfer?